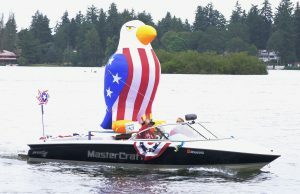 4TH OF JULY BOAT PARADE !!!!! Once again its time for our bigger, better and “badder” each year, 4th of July boat parade. Dig out your decorations, horses, eagles, Uncle Sam’s, pirate treasure chest or decorated dog, and join us if you can, to participating in the parade. Parade of boats, SeaDoo’s, kayaks, RC boats, or what ever else you have that can move through the water, will start at the south side of the bridge. Be there at 10:00 AM for a 10:15 departure. For those that want to watch, please come out and wave the boaters on. The parade will leave the bridge area heading south and onwards around the lake. The whole parade tour will take between 45 minutes to an hour to circumnavigate the lake, so time your locale accordingly. Let us know if you would be interested in a helping put together a progressive lake party, seeking individuals who would be willing to coordinate this event or be one of the hosts. Date/Time to be determined.